This image of the Orion Nebula was produced by a team of astronomers and other specialists led by Dr Massimo Robberto of the Space Telescope Science Institute in Baltimore, Maryland. This truly vast reach of roiling dust and gas is approximately 1500 light-years away but is the nearest star-forming region to Earth. What goes into capturing an image like this? 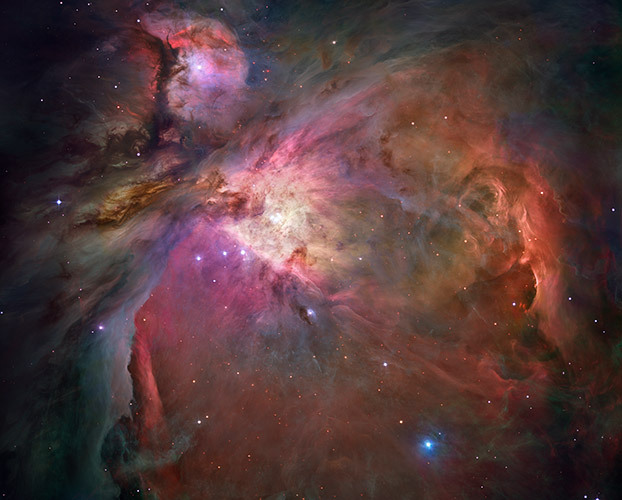 The Hubble Space Telescope image of the Orion Nebula is a by-product of a scientific study that required imaging the full region. About 10 years ago, it became clear that measuring with high precision the main parameters (luminosity, mass, age etc) of the ~3000 protostars forming in the Orion Nebula would provide a critical contribution to our understanding of how stars and planets forms. This required detailed observations with Hubble and it is from these observations that we have reconstructed the image. In more detail, the process starts with the write-up and submission of a science proposal for obtaining observing time with the Hubble. This is a highly competitive process, as only a small fraction of the proposals can be approved and get time. 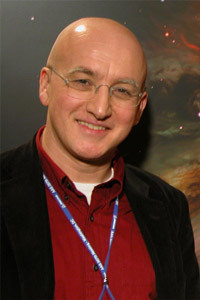 I have put together an international team of about 15 renowned experts that helped me write the science justification. Plus, I had to craft a clever way of using the satellite to reduce our request to "only" 104 orbits of telescope time, still a large amount. One orbit takes about 96 minutes, but only about 45 minutes can be used to take data (the rest of the time the Earth is in the way). The proposal was ranked very high and we got our Hubble time. The next step was the preparation of the observations, i.e. the choreography that has to be executed by the telescope to perform the program. This is basically a long list of commands, detailed to one second of accuracy. The Space Telescope Science Institute provides software and specialists to support astronomers in this phase. Then the data started arriving, spread over a period of six months, as we designed. I had a small team of three analysts helping me with the analysis of each image, to make sure there were no problems. Then we started the process of removing all instrumental artefacts (again, the Space Telescope Science Institute provided the needed software and support) and combined the images into sub-mosaics. This process lasted about one year. At the end, we were ready to begin our analysis, i.e. measuring the properties of the stars. At the same time, I delivered the sub-mosaics (35 pieces) to Zolt Levay and his graphics team at the Space Telescope Science Institute. Zolt put together the full mosaic, consulting me for the optimal choice of colours in order to reproduce the most realistic view of the region. I provided him with some ancillary data I had taken in Chile to fill gaps at the edges, and he finally delivered the image. Overall, about 50 people were directly involved with the production of the image. Does the image represent only visible light, or is it a synthesis of visible light and other wavelengths? Unlike commercial CCD cameras, the Hubble instruments use CCDs that take pictures in black and white. The instruments, however, have a large selection of filters (basically, coloured glass) that we can use to select particular wavelength ranges. So, for a three-colour (RGB) image we need three different images. In the case of the Orion picture, we had taken five images, so Zolt Levay could play with two extra colours to synthesize the final image. Of our filters, four selected wavelengths visible to the eye, while a fifth one selected a wavelength that we cannot see, in what I would call the "very-near Infrared" spectral region (about 8,500 - 10,000 Angstrom). How do you categorise your work? Is there an aesthetic aspect and an interest in the mystery of the cosmos or is it a matter of scientific discovery and mathematical clarity? I would say both, and I would say that there is no difference. 'Cosmos' in Greek means 'order' (the opposite is 'Caos'), not 'space' or 'sky', for which the right word is 'Uranos'. Cosmos is the right word to describe reality, which has a profound order that we can discover and understand with our reason. I find it amazing that our reason can understand the cosmos, as we are so limited and 'animal' in so many respects. There is a unique reason, a common 'logos', to use another Greek word, that we find in us and in what we have in front of us, at any single instant. I find that true beauty lies here, finding this more profound order in reality and realising that it corresponds, mysteriously, to what we are made of, and for. This image was produced back in 2006, what are you working on currently? I am quite busy working on the next giant space telescope, the James Webb Space Telescope, that we plan to launch in 2018. It will be an infrared telescope of unprecedented capabilities and will revolutionise astronomy. But I am also still working on the Orion Nebula. Our science program is a real treasure chest that we are still mining for discoveries, plus it allowed us to carry out extremely interesting follow-up observations. I should remark that a generation of post-doctoral students that worked with me on Orion is now growing into first-rank astronomers, bringing new leads and ideas. This may well be the most important contribution of the project.